Greetings! This is the 100th edition of Holsten Galleries News and I thought that the occasion calls for a little reflection on where we have been and where we are headed both as a glass gallery and in the overall glass art world. Many of you know that Holsten Galleries first opened its doors in Stockbridge, Massachusetts, in 1978. Some of you will also remember that we had a second gallery on Worth Avenue in Palm Beach from 1980-1990. In 2009, when the gallery transitioned from the original brick and mortar location to an internet based gallery, I decided that it was important to reach out to you with a newsletter every month since I would no longer be seeing you at the gallery or at art shows. I have enjoyed operating a world class virtual glass gallery for the past seven years and have been privileged to "meet" many new collectors on line and over the telephone. My plan is to continue to represent many of the finest glass artists in the world on line for many years to come. As to the future of what we used to call the "studio glass movement," from everything I can see this part of the larger art market is extremely healthy and vital. The number of major art museums hosting one-person shows by well-know glass luminaries such as Lino Tagliapietra, Dale Chihuly and others, as well as group glass exhibitions and exhibitions of major private collections, has grown exponentially in the past decades. The frequently asked question back in the 1980’s as to whether this relatively new expression is art or craft is a thing of the past. 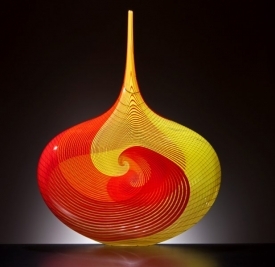 When many leading glass artists have pieces in the permanent collections of the Museum of Modern Art, the Metropolitan Museum of Art, the Victoria and Albert Museum and other major museums, it is more than safe to say that glass art has arrived as an accepted expression of artistic expression with its own unique characteristics and history. Thank you all for your support of Holsten Galleries over the past 38 years and also for supporting all of the glass galleries, museums and art shows, thus establishing contemporary glass art as a significant part of our lives and culture. This lovely piece from Lino’s "Angel Tear" series shows once again the technical virtuosity of the Maestro, particularly in the perfect flow of the cane work and balance of the two intense colors, vibrant yellow and red. 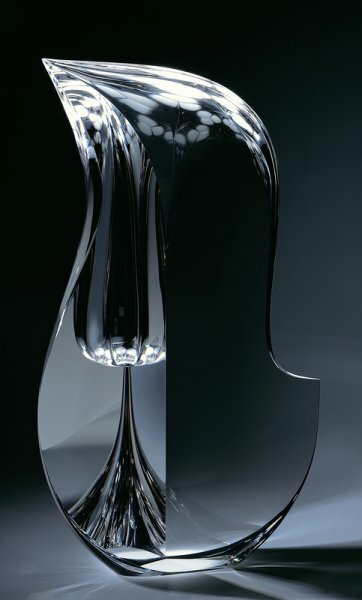 The "Embrace" series has long been one of my favorites of optical glass sculptor, Christopher Ries’s. I have seen examples of this series which are quite large in scale and others which are much more intimate. The remarkable optical effects which Chris creates almost as if by magic seem to hold true irrespective of the size of the sculpture. This is a magnificent new iteration of Nancy Callan’s well-known "Top" series. The lovely palette of multiple colors swirl to create endless patterns and color combinations. The cane work here is more organic than in many of Nancy’s pieces and to me this gives the piece a more fluid, slightly abstract feeling. 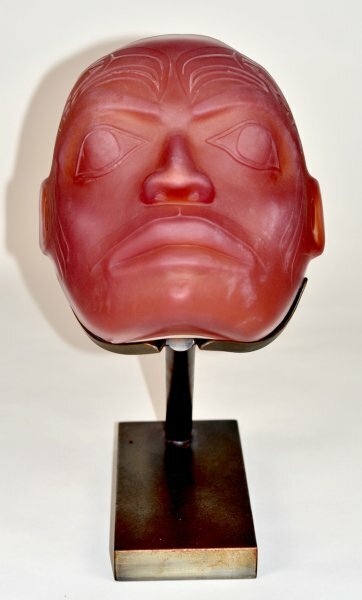 This "Mask" by Preston Singletary has just come on to the secondary market. It is an excellent example of this Singletary series and a strong reflection of his native Tlingit culure. 42.25 x 27.5 x 17.5"
Thanks for spending a few moments of your time to read this newsletter. I hope you have enjoyed it!